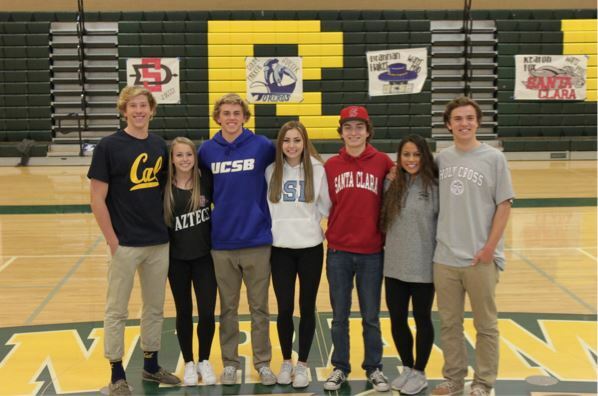 SRVHS senior athletes signed National Letters of Intent on February 4 in the Large Gym at lunch for the National Letter of Intent Signing Day. National Letter of Intent Signing Day is a celebration for students who are signing to commit to colleges for athletic scholarships. It is an important event for these students, because they decide where they are going to spend the next four years of their lives. Participants included Colby Parker, who signed to University of San Diego for soccer; Olivia Torres, who signed to University of Nevada, Reno for soccer: Rachel Speros, who signed to San Diego State University for soccer: Keaton Fox, who signed to Santa Clara University for water polo; Rory Birse, who signed to College of the Holy Cross for soccer; Brannan Haket, who signed to University of California, Santa Barbara for water polo; and Mikey Williams, who signed to University of California, Berkeley for water polo. The gym filled up fast with the athletes’ friends and family, who were incredibly happy to be able to watch them during this milestone. Participants could not stop smiling, suggesting that they would remember this moment forever. 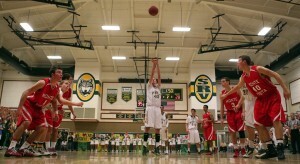 According to John Raynor, SRVHS’ Athletic Director, the school has had the event for 13 years.